Seems decent but maybe a bit too slow. It's a 1 mana card... why should it be any quicker. not bad but nothing special. maybe it will be played with more additional good hunter spells. Hunter spell is way better than random beast. Its better than macaw giving you a classcard. Macaw was played in Midrange/aggro hunter so will this. good card will see play. A 1 mana Beast that gives you another card when it dies? I'll take it. Zul'jin just got himself a little ally. I will be very surprised if this doesn't see play. Hunter gets another great 1-drop. This will definitely see play in the new Spell Hunter that Blizz is pushing. Definitely a solid card for Standard, especially with the rotation of Dire Mole and Fire Fly. Not good enough for current Wild. hunter has always loved it's one mana beasts. Might not look like much but neither did webspinner, and that bird that added random beasts to your hand. reminds me of webspinner, might see play cause of deathrattle and beast synergies. Glad to see at least 1 1-drop beast in the set seeing as we're losing so many in the rotation. This seems...fine. Not good, not bad. The very definition of "playable". 1 mana hunter minions are always good and always playable and this card offers some good value and can actually see play with the mid-range/beast hunter along side the hyennas since some of the beasts in this deck are rotating out and if u get to dire frenzy this u get 3 1 mana 4/4 that gives u spells. I'll take it ! Way better than that Shimmering Tempest. It will definitely see play just like Jeweled Macaw and Webspinner, but this is stronger, because the hunter spells are relatively cheap. 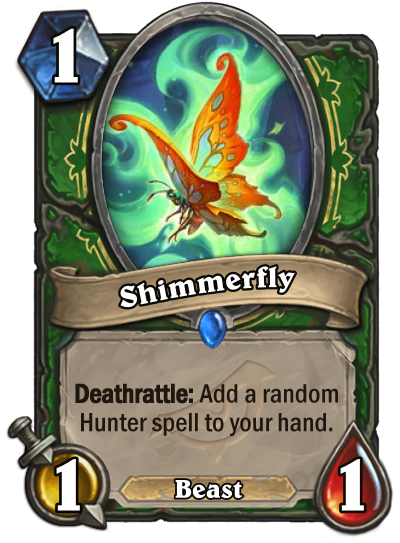 If hunter gets a decent 2-drop (something almost as powerful as Crackling Razormaw), then the butterfly will become a horrifying beast. It's deathrattle, so Webspinner would be a better comparison. Solid card, 1 mana 1/1 + spell seems good so far. and it has the Beast Tag - which could help alltough i kinda get the feeling that mech Hunter could be a thing this expansion! You guys seriously think Zul'jin wants a RANDOM spell when only a few select spells actually work with him? This card is trash in Zul'jin deck. And springpaw + timber wolf are better for beast hunter. Trash card for Nine lives deathrattle deck. Obviously too weak for Wild. I see no hope for this card. It wouldn't be revealed this late if it was a good card anyway, so it's blizzard that first told us, this card is TRASH. By the way, Macaw only see play in budget decks, or bad decks. Webspinner haven't seen play for years. This is worse than macaw and webspinner.